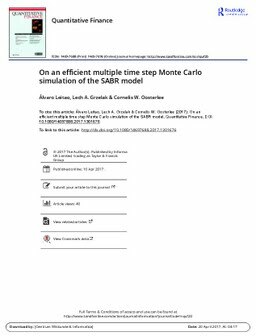 In this paper, we will present a multiple time step Monte Carlo simulation technique for pricing options under the Stochastic Alpha Beta Rho model. The proposed method is an extension of the one time step Monte Carlo method that we proposed in an accompanying paper Leitao et al. [Appl. Math. Comput. 2017, 293, 461–479], for pricing European options in the context of the model calibration. A highly efficient method results, with many very interesting and nontrivial components, like Fourier inversion for the sum of log-normals, stochastic collocation, Gumbel copula, correlation approximation, that are not yet seen in combination within a Monte Carlo simulation. The present multiple time step Monte Carlo method is especially useful for long-term options and for exotic options.